A month ago the Cardinals trailed the Braves by 10 1/2 games. Today they won the National League Wild Card. The Cardinals have won the National League Wild Card. 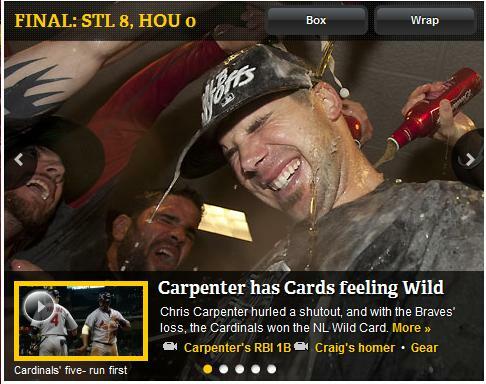 As the Braves and Phillies played a cliffhanger, Chris Carpenter and the Cardinals did their part at Minute Maid Park. Carpenter dominated the Astros and his offense gave him five runs before he even took the mound in a 8-0 drubbing of Houston. Atlanta then lost, 4-3, to Philadelphia in 13 innings to give St. Louis the Wild Card. The Cardinals have completed one of the greatest comebacks in baseball history. On the morning of Aug. 25, they trailed the Braves by 10 1/2 games in the NL Wild Card race, and were 10 behind the Brewers in the NL Central. Since then, they’ve gone 23-9, while Atlanta went 11-20. It’s the Cardinals’ second time as the Wild Card, following a 2001 tie with the Astros. Houston was designated the NL Central champion based on head-to-head record, while the Cardinals were designated the Wild Card, though the organization considers that year a co-championship. It’s St. Louis’ eighth postseason bid in 12 years.